French Ambitions and Secret agents in India: An assessment of the travels of the Abbe Carre from France to India from a global perspective. Was Homer – author of the Iliad and the Odyssey – a real historic figure or a fictional character? This is one of the biggest mysteries in ancient history and the subject of one of the biggest discussions in the field of ancient history, called the ‘Homeric Question’. Scepticism about ‘Homer’ and the Homeric works was already present in Antiquity, among the classic philosophers and other critical authors. Two leading points of view in this discussion are on the one hand scholars who claim that there was indeed a real person called Homer, who lived in the eighth century BC, and on the other hand scholars who claim that there was no real ‘Homer’, and that this person was invented in the sixth century BC by a group of rhapsodoi. Figure 1: Marble bust of Homer, Roman copy of a Hellenistic original. From Baiae, Italy. Now in the British Museum, London. One relatively recent theory about the existence of a ‘real’ Homer states that the uncertainty about authorship of a work brought about an aura of anonymity and, therefore, a better claim of universal authority. The ‘real’ Homer, according to this theory, deliberately kept his identity a secret to support his religious – since ancient mythology was completely interwoven with ancient religion – authority. If, however, Homer was not a real person, but a fictional character, the embodiment of a (literary) movement, this brings about the question of who or what ‘invented’ Homer. One of the leading theories on this side of the discussion is that Homer was invented by a group of rhapsodoi – people who recited poems and epics for the greater public – called the ‘Homeridae’, who came from the island of Chios and claimed to be descendants of this ‘Homer’. They were probably a group of wealthy Greeks, who were among the Greek elites and used their elitist networks to spread the works and fame of this ancestor called ‘Homer’. Network theory and network analysis have been used as tools to research social networks and relationships between social actors in Antiquity. Especially the ‘network of stories’, that shows the flow of myths through Greek ancient society, offers an insight in the development of a Panhellenic religious network that would grow to become the ‘official’ Greek religion. The ‘network of stories’, based on an ancient oral tradition and founded by ancient Greek authors, owes most of its coherence and authority to its public and groups of performers that spread the stories throughout the entire Greek world. By researching these groups of actors and applying network theory, the spread of the earliest literature and the ‘network of stories’ can be analysed. 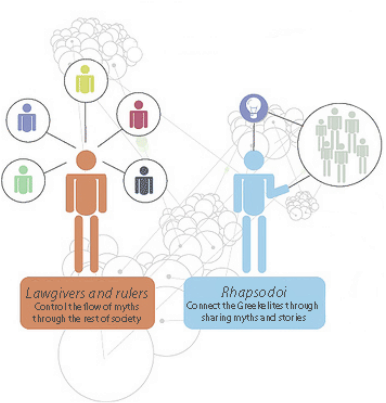 Figure 2: Schematic view of the roles the rhapsodoi (performers) and Greek elites had in the 'network of stories'. Figure 3: Map of Ancient Greece showing part of the spread of Homeric works from Chios, via Delos, to all corners of the Archaic Greek world. The Homeridae were responsible for the biggest spread of the Homeric works in Greek antiquity. They connected their works to a historic figure called ‘Homer’, who was supposed to be their ancestor (Homeridae literally means ‘descendants of Homer’). Not only did they claim to be his descendants, but they also published their own works under his name. one of the most important of these rhapsodoi was a man called Cynaethus, who was by some credited as the author of the Homeric hymn to Delian Apollo. The Homeridae were not the only ‘guild’ of rhapsodoi. 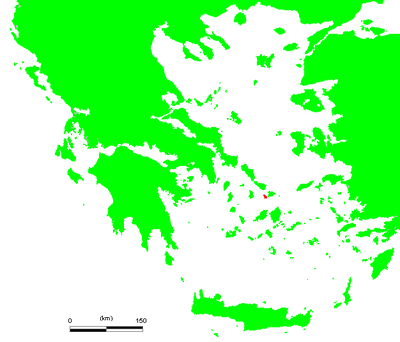 There were more groups of rhapsodoi who claimed to be descendants of an authoritative person, like the Creophylae on the island of Samos, who claimed to have a common ancestor called Creophylus. These ‘guilds’ functioned as the most important nodes in the ‘network of stories’, through which poems and epics like the Homeric ones were spread. Starting with the Delian festival in 523 BC, hosted by Polycrates of Samos, the dispersion of the Homeric works really kicked off when the Homeridae, who had written down Homers body of work, used their personal elitist networks to spread Homers fame. The epics and poems ended up in the hands of lawgivers and rulers, who bought them to their own poleis – city-states – and used their authority to lay them down on the ‘common’ people. 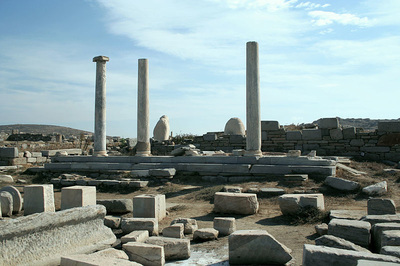 The best example of the impact this spread of the Homeric works had on Greek society was probably the city of Athens, where Hipparchus, son of the tyrant Peististratos and ruler of Athens at the end of the sixth century BC, installed the Homeric epics as standard part of the Panatheneia, one of the biggest festivals of Athens in Antiquity. My research focused on the Homeridae as nodes in the ‘network of stories’, responsible for the spread of the Homeric works. Without them, the Homeric epics and poems would probably not have ended up as widely known as they eventually were in Greek Antiquity. Their interest in the Homeric epics and their collecting of ‘his’ works were the cause of the biggest spread of these myths through the network of rhapsodoi and their elitist connections. Through this, they had a huge influence on the Panhellenic mythology and religion. The Homeridae have been among the most important nodes within the ‘network of stories’, which stood on the base of Greek religion, and were responsible for the flow of Homeric poems and epics throughout Greek society. This network, starting in Chios and, through Delos and Samos, ending up in all corners of the Greek world, have been an essential part of the development of a shared Greek identity. Alan, W., Homer: The Iliad (Bristol: Bristol Classical Press, 2012). Bowden, H., ‘Cults of Demeter Eleusinia and the transmission of Religious Ideas’ in Malkin, Irad; Constantakopoulou, Christy; Panagopoulou, K. (ed. ), Greek and Roman Networks in the Mediterranean (London: Routledge, 2009). Collar, A., ‘Network Theory and Religious Innovation’ in Malkin, Irad; Constantakopoulou, Christy; Panagopoulou, Katerina (ed. ), Greek and Roman Networks in the Mediterranean (London: Routledge, 2009). Constantakopoulou, C., The Dance of the Islands: Insularity, Networks, the Athenian Empire, and the Aegean World (Oxford: Oxford University Press, 2007). Crudden, M., The Homeric Hymns (Oxford: Oxford University Press, 2001). Faulkner, A. The Homeric Hymns: Interpretative Essays (Oxford: Oxford University Press, 2011). Malkin, I, Constantakopoulou, C, Penagopoulou, K., ‘Preface: Networks in the Ancient Mediterranean’ in Mediterranean Historical Review 22, nr. 1 (2007), 1-9. Mikalson, J.D., Herodotus and Religion in the Persian Wars (Chapel Hill, NC: University of North Carolina Press, 2003). Nagy, G., Homeric Questions (Austin, TX: University of Texas Press, 1996). Ogden, D, A Companion to Greek Religion (New York, NY: John Wiley & Sons, 2008). Raynor, D.J., The Homeric Hymns: a Translation with Introduction and Notes(Los Angeles, CA: University of California Press, 2014). Richardson, N., Three Homeric Hymns: to Apollo, Hermes, and Aphrodite (Cambridge: Cambridge University Press, 2010). Rutherford, I., ‘Network Theory and Theoric Networks’ in Malkin, Irad; Constantakopoulou, Christy; Panagopoulou, Katerina (ed. ), Greek and Roman Networks in the Mediterranean (London: Routledge, 2009). West, M. L., ‘Cynaethus’ Hymn to Apollo’ in The Classical Quarterly 25, nr. 2 (1975), 161-170. - Homeric Hymns, Homeric Apocryphia, Lives of Homer (Cambridge, MA: Harvard University Press, 2003). - ‘The Contest of Homer and Hesiod’ in The Classical Quarterly 17, nr. 2 (1967), 433-450. - ‘The Invention of Homer’ in The Classical Quarterly 49, nr. 2 (1999), 364-382. Marble bust of Homer, British Museum: http://www.britishmuseum.org/explore/highlights/highlight_objects/gr/m/marble_portrait_bust_of_homer.aspx. 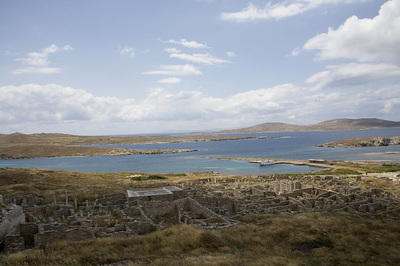 Panorama of Delos: "Delos Panorama1" by Charles Haynes http://www.flickr.com/photos/haynes/ - http://www.flickr.com/photos/haynes/167233678/. Photo of Artemision: "Ruines de Délos" by Romain Delanoë - originally posted to Flickr as P9010036.